What’s the best diet to promote a healthy brain? A heart-healthy diet that is rich in fruits and vegetables and that includes fish over meat, limits full-fat dairy foods and includes nuts and alcohol in moderation may be your best bet, according to a new report. The study assessed people’s eating habits beginning in their 20s and then looked at them three decades later. Those who ate the heart-healthiest diet tended to have the lease declines in thinking and memory skills in midlife, the study found. For the study, in Neurology, researchers followed 2,621 men and women, most of whom were in their mid-20s at the start of the study. They were asked about their diet at the beginning of the study, and again filled out detailed food questionnaires in their early 30s and again in their 50s. Study participants also underwent tests of memory skills when they were about age 50, and again at age 55. 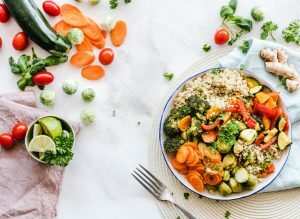 The researchers grouped participants according to how closely they adhered to three diets that have been shown to promote heart health. All the diets tend to be high in fruits and vegetables and whole grains, limit red meats, and opt for low-fat dairy foods. One was the Mediterranean diet, which is high in fruits, vegetables and whole grains and legumes; opts for “healthy” fats like olive oil over butter; is moderate in protein and animal fats and chooses fish over red meats or chicken; avoids full-fat dairy foods; and may include alcohol in moderation. The Mediterranean diet has been shown in many studies to be beneficial in reducing the risk for diabetes, heart disease and stroke. Another was the Dietary Approaches to Stop Hypertension, or DASH, diet. The DASH diet is low in sodium; emphasizes grains, vegetables, fruits, low-fat dairy, legumes and nuts; and limits meat, fish, poultry, total fat, saturated fat and sweets. The third diet was what the researchers called the CARDIA a priori Diet Quality Score, or APDQS. The APDQS diet emphasizes fruits, vegetables, legumes, low-fat dairy, fish, and moderate alcohol, and limits fried foods, salty snacks, sweets, high-fat dairy and sugar-sweetened soft drinks. For each diet, study participants were divided into one of three groups, according to how closely they followed the diet in question. The researchers found that close adherence during young adulthood to a Mediterranean or APDQS diet most strongly predicted less decline in memory and thinking skills in middle age. Benefits were especially pronounced on tests of executive function, which involves organizing and planning. For example, people with “high” adherence to the Mediterranean diet were 46 percent less likely to have poor thinking skills than people with “low” adherence to the diet. Of the 868 people in the high group, 9 percent had poor thinking skills, compared to 29 percent of the 798 people in the low group. Those in the “high” adherence group at an average of 4.2 servings of fruit and 4.4 servings a vegetables a day, compared to 2.3 servings of fruit and 2.8 servings of vegetables for those in the “low” adherence group. Those in the APDQS group showed similar benefits. The researchers corrected for other factors that can affect cognitive health, such as smoking, diabetes and how much exercise someone gets. Still, the dietary benefits of a fruit- and vegetable-rich diet persisted. The study cannot prove cause and effect. Rather, it shows only an association between a heart-healthy diet and a diminished risk of developing cognitive problems. Still, as many other studies have found, what’s good for the heart is likely also good for the brain, whether that’s diet, exercise or a combination of these and other factors.